Is Kyvno recommended for those with difficulty getting in and out of bed? Memory foam, in general, is not typically recommended for customers with physical disabilities or those with trouble getting in and out of bed. This is because sitting on the edge of a memory foam mattress will cause all weight to be isolated, resulting in a slight sinking effect. This is not usually noticeable to those without disabilities or major injuries but can present a challenge for others. Please also consider this bed is a level 6 (medium) in firmness to determine if this is the right fit for you or your loved one. How firm is the Kyvno mattress? All of our mattresses are ranked as a “medium” level of firmness. On a scale of 1 to 10, with 10 being the firmest, our mattresses are rated to be a 6. Can Kyvno be used as a medical bed? The Kyvno Kit is designed for household use only. It is not intended to be used as a medical bed. Do not use while using or wearing medical devices, while aerosol (spray) products are being used, or where oxygen is being administrated. Does Kyvno offer a standard king-sized bed without the split? Kyvno does not currently offer a standard king-sized Kyvno Kit. If you have hesitations about purchasing the split king or want to know more, check out our blog post on why a split king adjustable bed could be the best decision for you and your partner. What sheets do I need for the split king? To adjust both sides of your split king bed separately, you will need to use two twin XL fitted sheets and one king flat sheet. For more information on our split king Kyvno Kit, check out our blog post. How soon will I receive my Kyvno Kit? Your Kyvno Kit, adjustable bed, will ship ground via FedEx from our Texas warehouse within 1 to 2 business days of placing your order. You will receive an email confirmation with your FedEdx tracking number once your order has shipped. FedEx standard ground shipping within the Continental U.S. is between 1 to 7 business days. *Shipping times vary based on holidays. How do I track my Kyvno Kit shipment? To track your Kyvno Kit, use the FedEx tracker. Not at all! We cover the shipping costs for you. Only Standard Ground Shipping is available at this time. Can I purchase a Kyvno Kit if I live outside the U.S.? We currently only ship to the Continental U.S. addresses but give us a call or chat live with further questions. If you’ve completed the checkout process and need to cancel an order, call 1-844-667-2794. Our Kyvno Care Team will get you taken care of. If you haven’t completed your order, click on the cart symbol and add or remove items using the + or – signs. If you’ve already completed checkout, give us a call at 1-844-667-2794. Our Kyvno Care Team will get you taken care of. To ensure lighting speed ordering, free of human error, the Kyvno Kit can only be ordered online. What if I have additional questions about your Kyvno Kit? No worries! Our Kyvno Care team is ready and eager to answer any questions you may have. Give us a call at 1-844-667-2794 or write us at info@kyvno.com. Prefer to Chat? Just click on the chat icon at the bottom of the screen. Can my Kyvno mattress be used on a different foundation? The Kyvno mattress and adjustable bed frame must be used together in order to maintain your warranty. To see more information on our warranty please click here. Can I buy a mattress without an adjustable base? We wouldn’t do our mattress justice selling it without the base! The “Kyvno Kits” are sold as is and include an adjustable bed frame and memory foam mattress. This combination is what makes Kyvno so effective! Is the Kyvno mattress flame retardant? Yes, it’s true we’re on fire…but not literally! Although we offer a smoking hot product, our mattresses pass US fire retardant regulations with flying colors. How is the Kyvno mattress constructed? Our Kyvno sleep engineers worked tirelessly to create a best-sleep-of-your-life combination of cooling-gel memory foam, convoluted foam for even weight distribution and environmentally friendly, high density certipur foam. They sprinkled in a dash of love and wrapped it in a non-slip, easy to wash cover. See our mattress diagram to learn more. Will the Kyvno Kit fit my bed frame? All bed frames are unique! 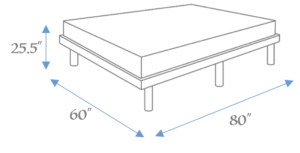 Headboard and footboard heights vary drastically from bed to bed so we recommend using our Kyvno Kit dimensions below to compare the kit to your bed frame. Still not sure? We’ll help you figure it out. Give us a call at 1-844-667-2794 or write us at info@kyvno.com. Prefer to Chat? Just click on the chat icon at the bottom of the page. What mattress or adjustable frames compare to Kyvno? We’re glad you asked! See how we stack up against other mattress and adjustable bed companies on our comparison chart. What medical benefits does the Kyvno offer? There’s a reason wellness gurus love adjustable beds…they’re scientifically proven to drastically increase health by helping you achieve deeper and longer sleep increasing brain power, strengthening your immune system, and alleviates aches and pains including: lower back pain, heartburn/acid reflux, diabetes symptoms, and Asthma. What is the 120 Day Satisfaction Guarantee? Try your Kyvno Kit for 120 nights, risk free! Go ahead…sleep on it, read on it, watch your favorite movies and if you don’t love it, return it. We’ll handle pickup, free of charge and provide a full refund. We do ask that you kick back on your Kyvno Kit for at least 30 nights to allow your body to adjust to the feel of a brand-new mattress. Why is the Kyvno Kit so much less than the mattresses in retail stores? As an online only company, we don’t have overhead costs on showrooms, salespeople, and inventory. This means we can pass these savings directly to the end consumer, i.e. YOU! Are there stores where I can try out the Kyvno Kit? This one-of-a-kind Kyvno Kit is currently only available at Kyvno.com and not available to test in stores. BUT we’re confident you’ll love our 120 Day Sleep Satisfaction Guarantee. Instead of testing a mattress for 15 mins in a store, you can order it from the comfort of your home, have it delivered, and try it for 120 days risk free!